Apostrophes for contractions and possession, and for "it's"
Do you know when to use "to", "too" and "two"? Click on a topic then try the game or scroll down to "Documents" to print out flashcards. When you look up a word you can also click on "Thesaurus: synonyms and related words" to find similar words. To look up what words mean click on "Dictionary" at the top. A bright and amusing book with simple explanations and lots of examples to help readers express themselves more clearly in English. It shows how to avoid common mistakes in written English, which punctuation marks to use and sets out the rules (and exceptions) for English spelling. 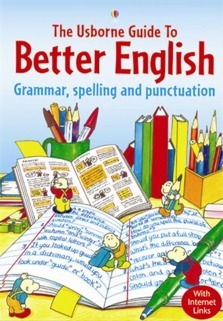 This book contains the following Usborne Guides: English Grammar, English Spelling and English Punctuation. This book was amazing - I really enjoyed it! I would recommend it to anyone who wants to improve their English skills.